(Geodesic Dome) 4,8m diameter, Wood, LS Solarwoven Ultra, tar paper, solar panels, irrigation system for plants,surveillance camera. we will have a increasing population on our planet, I expect that i will need to limit my living space and also produce energy and grow plants for food and a healthier living environment. I believe we will also need to have a relation ship to nature through plants. 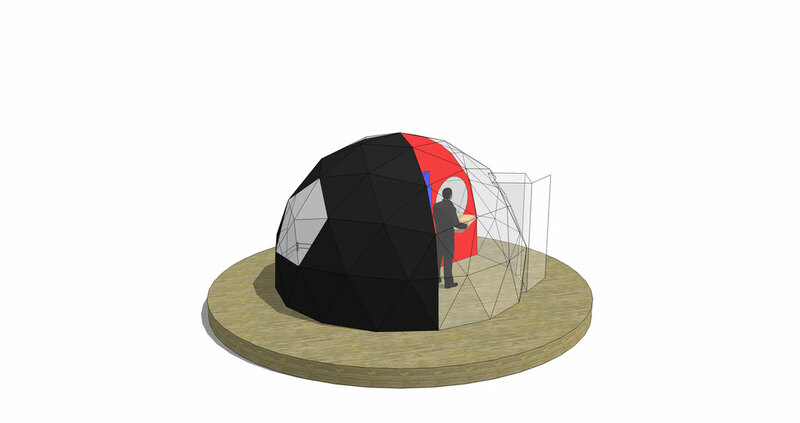 In "Three chamber Dome" I have reduced my primary needs in a model displayed in the dome. The firs room is for creativity, its a room for work/studio during the exhibition visiters can draw paint on the walls or use the room in the way they find make sence. The second room is a kind of living room and green house area. (Geodesic Dome)4,8m diameter,Solarwoven Ultra,Solar panels,automatic irrigation system. 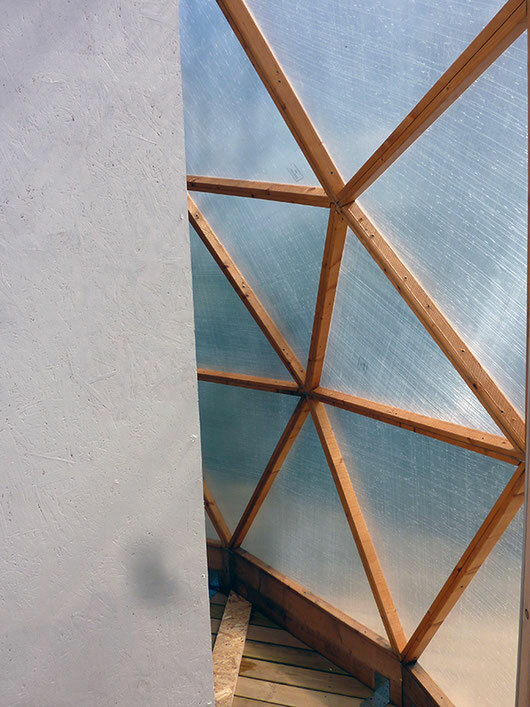 The solar panels supporting the dome with sun energy is placed close to the dome and supports a battery with electricity. 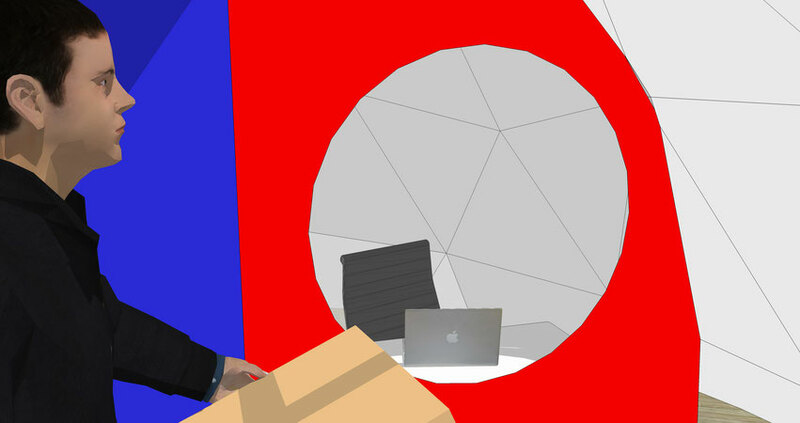 The electricity system is also connected to the power grid so the dome is both independent and in a symbiotic relationship with the surrounding world. 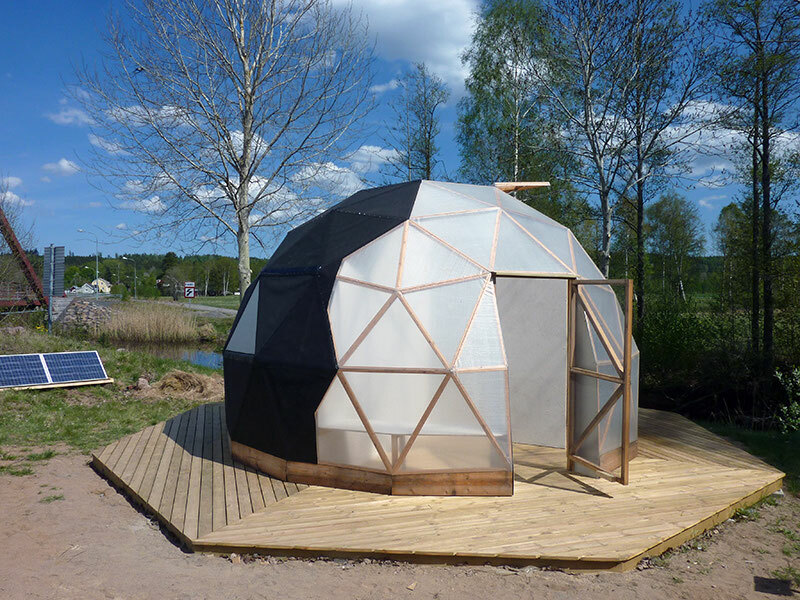 The open greenhouse window on the top of the dome is automaticly regulated with a gas piston. 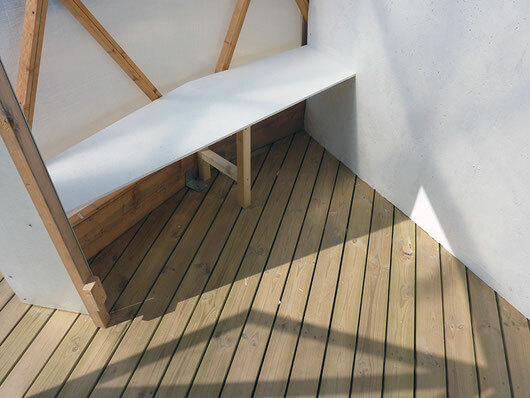 The studio/working space will be a creativity room for the public in all ages, drawing and painting equipment will be provided so visiters can work and also use the walls. From the working space visitors will enter the green house part what also could be used as living room. 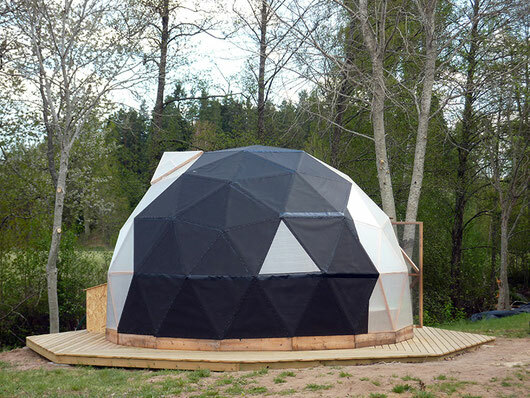 (Geodesic Dome)4,8m diameter,LS Solarwoven Ultra. The green house part and living room covers 50% of the dome area. 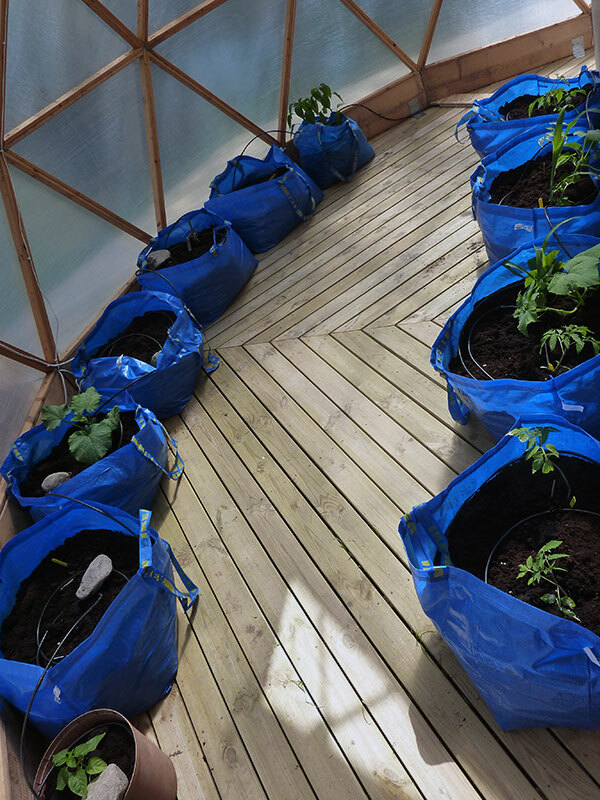 In the IKEA bags are tomatoes, zuccinis, beans, peas, mays, potatoes and Dahlia plants growing. The plants are automaticly watered from a irrigation system. A surveillance Camera sends picture from the plants. The bed room is very simple a triangular window, a bed, bedside table and a lamp. 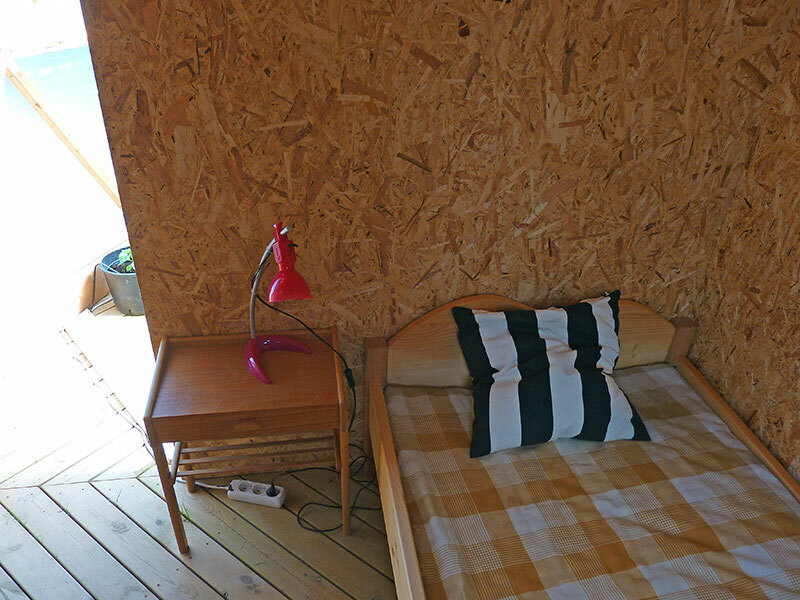 Thee room is free to use and does have electricity for computer or charging mobile phone.